Some people think I know a lot about gardening because I often write about my garden. What a laugh. The little I do know has come mostly from mistakes I’ve made. My latest pear debacle is a good example. When our new pear tree produced hard pears that refused to ripen for the third year in a row, I finally sensed I was missing some key piece of pear-growing knowledge. I Googled “pears won’t ripen on tree” and learned that NO pears ripen on the tree. They are picked when hard, chilled for two to six weeks, and then ripened at room temperature. If allowed to hang on the tree past maturity, they will rot from the inside out. All those pears we threw away….. I wised up in time to rescue this year’s crop. A couple of dozen pears are now chilling in the crisper, awaiting an elegant fate. Assuming they eventually ripen, I could make one of the pear recipes I’ve devised in the past – pear and blue cheese slaw, poached-pear fruit salad or frozen pear and ice-wine pops, to name a few. They were all delicious, but I want something different. I want to make a pear cake I can’t stop thinking about. My friend, Nancy, brought me a slice of a spicy, moist apple cake as a birthday greeting. I immediately envisioned making it with pears because the flavors – ginger, honey and lemon – go so well with pears. Instead of apples, I’d top the cake with a gorgeous fan of accordion-sliced pears. I thought about the cake as I picked my rock-hard pears. I think about the cake every day as I peer at the drawer full of fruit in the bottom of my refrigerator. Will this be the year I finally taste a home-grown pear? In a couple more weeks I’ll transfer the pears to the kitchen counter and by late October they should be ripe and juicy. They had better be. If not, I’ll cut down the damn pear tree and buy my pears from now on. Either way, I’m making that cake. Those who like to experiment could add other pear flavor companions such as ground cardamom, almonds or walnuts. 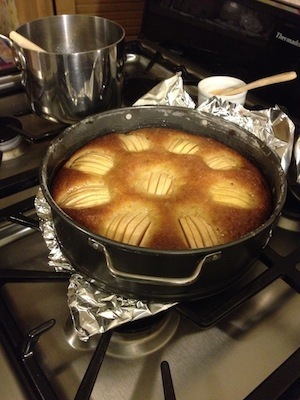 I liked the cake as Nancy baked it – but, of course, with pears. The original apple cake recipe was from the New York Times. Heat oven to 325 degrees and position a rack in the middle of the oven. Butter and flour a 9-inch springform pan. With an electric mixer, cream the butter and sugar, then add honey and whip for 1 minute, until fluffy. Beat in eggs one at a time, until well incorporated, then whip for 2 minutes. Stir in grated ginger, candied ginger and lemon zest. Whisk together flour, salt and baking powder and add to bowl, mixing briefly to make a stiff batter. Pour batter into prepared pan. With a paring knife, cut horizontal slits 1/8-inch apart on the rounded part of each pear half, slicing just partway through. Arrange pear halves slit-side-up in a circle over the batter. Sprinkle cake with 1 tablespoon sugar. Place cake pan on a baking sheet on middle rack of oven. Bake for about 45 minutes, or until an inserted skewer emerges dry. If cake is browning too rapidly, tent with foil until done. Cool on a rack, then carefully invert onto a serving plate. Combine sugar, honey and lemon juice in a small saucepan over medium heat, stirring until sugar is dissolved and mixture bubbles, about 2 minutes. Paint surface of cake and pears with warm glaze. If, like me, you wondered about raw honey after reading the pear cake recipe above, here’s the scoop. Raw honey is honey in its natural state, as it comes from the hives. It contains pollen, bits of wax and maybe bits of bee wings, etc. It is cloudy and very thick. Most honey sold in supermarkets is pasteurized and filtered so it looks clear and flows more easily. The pollen is filtered out. Raw honey is used by some people to ward off seasonal allergies, although its effectiveness is in doubt, according to the National Institutes of Health. However, research has shown it to be an effective topical antibiotic and treatment for minor burns. Infants under age 1 should never be given honey. Once again that enterprising Boy Scout Troop 334 in Green will be turning cabbage rolls into cash on Saturday. For the second year, they’ll be setting up a major cabbage-roll operation in the parish life center at Queen of Heaven Catholic Church, 1800 Steese Road in Uniontown. Dinners of two cabbage rolls with sauerkraut, mashed potatoes, a roll and beverage will be available for eat-in or carry out from 4:30 to 6:30 p.m. The kind folks at Hermann’s Pickles in Garrettsville will again donate the kraut. They’re the wizards behind Nathan’s Famous Gourmet Sweet Horseradish Pickles, so you can bet their sauerkraut is good. The dinners are $8 for adults and $6 for children. Bulk orders of cabbage rolls are available for $3 per roll, 6 for $16 or 12 for $30. When I’m expected to take a dish to a pot luck, I freeze like a deer in the headlights. I know my contribution will be received with certain expectations. In my mind, nothing will be good enough. Usually I dither until the last minute and show up with something embarrassingly simple, like dried figs with mascarpone-rosemary dip. Finally, I found someone who understands this. Read Kathi Purvis’ take on her shame at taking store-bought cookies to a potluck affair at http://www.charlotteobserver.com/living/food-drink/kathleen-purvis/article35204898.html. Tell John to check thrift shops for aluminum Dutch oven-type roasters and cookware, too. I use mine sometimes for a New England-style boiled dinner or pot roast with the carrots and potatoes. I actually buy the used roasters whenever I see them (along with Foley food mills) because there’s always someone looking for one. Dear Anne: I know just the kind of roaster you mean, and it’s heavy-duty – just what John wants. Thanks for the tip.